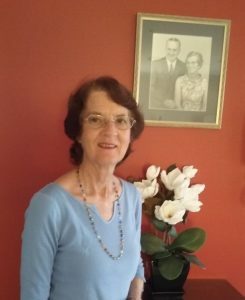 In her presentation Mariette talks briefly about the life of her father, his growing up years in South Australia, his marriage to Madge Green and the bringing up a young family of five children, and how he managed a successful engineering business for many years. She talks about the time when he was appointed as Hand of the Cause in October 1957 by the beloved Guardian, and his subsequent outstanding service to the Faith in Australia and internationally travelling to many countries until he finally passed away in Kathmandu, Nepal, on 29th September 1990. It was his wish that he ended his life in dedicated service to Bahá’u’lláh “with his boots on” and not in a rocking chair! Mariette Leong grew up in a family of four girls and a boy in Adelaide, South Australia. Her parents were Madge and Collis Featherstone who heard of the Bahá’í Faith in 1944 and became actively involved with the growth and development of the community right from the time of their declaration. Together with her older sister Joan, Mariette travelled to Malaysia to attend the first South East Asian Regional Youth Conference in December 1968, with the encouragement of their father. This was intended to be a stopover before proceeding to India which was their originally intended destination. Fate intervened, however, and the sisters ended up marrying their respective husbands In Kuala Lumpur. Mariette returned to Australia at the end of 1971 with husband Ho-San Leong. In 1974 she pioneered with her husband to Papua New Guinea and lived there over a period of 26 years, serving the Bahá’í community in various capacities, and was on the National Spiritual Assembly at one stage as its Secretary. Mariette worked part-time in different jobs from developing a secretarial course and presenting it at a business training institute to teaching piano professionally. She is now teaching piano to four of her grandchildren. Mariette and her husband have retired to live in the coastal city of Wollongong about two hours south of Sydney, Australia. They have four children and also an adopted Papua New Guinean daughter, all married, and nine grandchildren.